Here are 10 mother-toddler programs that combine the best of techniques to impart crucial skills while also keeping the environment light and fun for the parent and child. While most programs go by the name of “mother-toddler”, unless otherwise specified, most of them welcome dad and grandparents too! Babies are receptive to touch and smell and a sensorial class will work wonders for their cognitive and emotional development. Baby Sensory offers little babies, right from birth up to 13 months, stimulatory activities designed to meet international standards. With the right doses of stimulation and rest, babies are known to respond better and develop in a healthier way. Classes offered include action songs, balance, imagination, cognitive, emotional and language skills. While most educational pedagogy concentrates on developing the logical thinking and therein the left brain faculties, RightBrain is the first education program that stresses on boosting memory, intuition, concentration and observation. The parent-child program uses techniques that boost the innate curiosity and thirst for learning in toddlers. Classes offered include balance, general knowledge, motor and imagination skills and coordination. 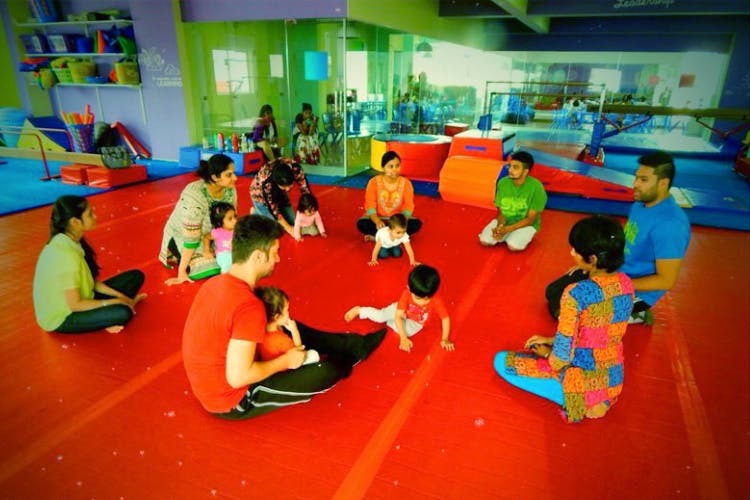 True to its name, The Little Gym provides little kids the much-needed outlet and the required training to build their muscles and train them in skills like martial arts, gymnastics, dance and more. They aim to raise happy and confident kids through a range of programs including the parent-toddler classes. Classes offered include floor exercies, gynmnastics, and physical fitness. There’s scientific evidence that music and dance benefit little kids in more ways than one. Rhythm N Rhyme conceptualizes programs that use music and dance movements. that There’s a pattern that kids begin to recognize and the movement helps them with the coordination and develops their cognitive faculties. Classes offered include action songs, creativity, earlu socialisation, motor skills, sharing and communication. Toddlers largely learn from play, a lot of which is unstructured and at home. This mother-toddler program focuses on getting a structured schedule for them that includes plenty of creative activities and circle time. The parent/caregiver gets to bond on a one-on-one basis. Their Early Explorer program is a great way for parents to pick up developmental techniques that can be used at home. Classes offered include coordination, cognitive skills, early socialisation, emotional skills and mobility. India’s first Norwegian Kindergarten uses the Scandinavian methods of raising young, confident kids who love to learn through play and exploration. Their play equipment is designed with a lot of thought and care. Every child is allowed to learn and grow at his/her natural pace. Classes offered include action songs, communication, early socialisation, emotional and motor skills, music learning and story telling. The transition of a child from toddlerhood to the pre-school years is an emotional one for the mother as well as the child. The activities at Mommy and me with Su are aimed to understand the emotional, social and physical needs of a child so that both-the parent and the child-are well prepared when the time for transition arrives. Dads are most welcome to participate too! Classed offered include cognitive, motor and emotional skills, early socialisation, creative thinking and physical activity. Head over to The Rainbow Villa at St.Marks Road, the aesthetics of the colonial villa will charm you first and then their well-designed, thought out activities for toddlers will further impress you. The teachers are professionals who understand the developmental and emotional needs of toddlers. Their programs are conceptualized accordingly where the parents play an equal role. Classes offered include action songs, coordinatin, early socialisation, motor and emotional skills, sharing and self-esteem. Toddlers love to explore and use their limbs to explore and The Atelier focuses on this aspect. From activities that let the child understand the different sounds of metal, the texture of different materials, the parent-toddler program creates meaningful opportunities and connections with the real world. Bond with your child emotionally as you experience their growth. Classes offered include story telling, cognitive, motor and emotional skills, action songs and play-based learning. As much as young children need to interact with other kids of their age, so do parents and caregivers who need a relaxed space to meet other parents. While toddlers learn the concept of sharing and enjoy playing with other toddlers, the activities aid their physical and emotional growth. A healthy eating practice is incorporated by including a fruit time. During the session kids learn rhymes, communicating with other kids, sharing and enjoy their free time. First one hour of free play includes playing with toys, sandpit, slides, activities like clay dough, puzzles, drawing, building blocks, dressing up and then fruit time followed by rhyme time. This post first appeared on Buzzing Bubs. Read the entire post here.